Edina, Minnesota - November 4, 2017 – The Laborers International Union of North America (LIUNA) Local 563 launched a new phase of a campaign to educate Southdale Center shoppers the public about the hazards that shoppers can face if contractors potentially fail to follow proper safety procedures during asbestos removal and other aspects of mall renovation with an action that will be streamed on Facebook Live. The union’s effort will kick-off on Saturday, November 4, at 2 PM at W 66th St and Drew Ave S., and will be available via Facebook Live on the LIUNA Minnesota and Shop At Your Own Risk Facebook pages. 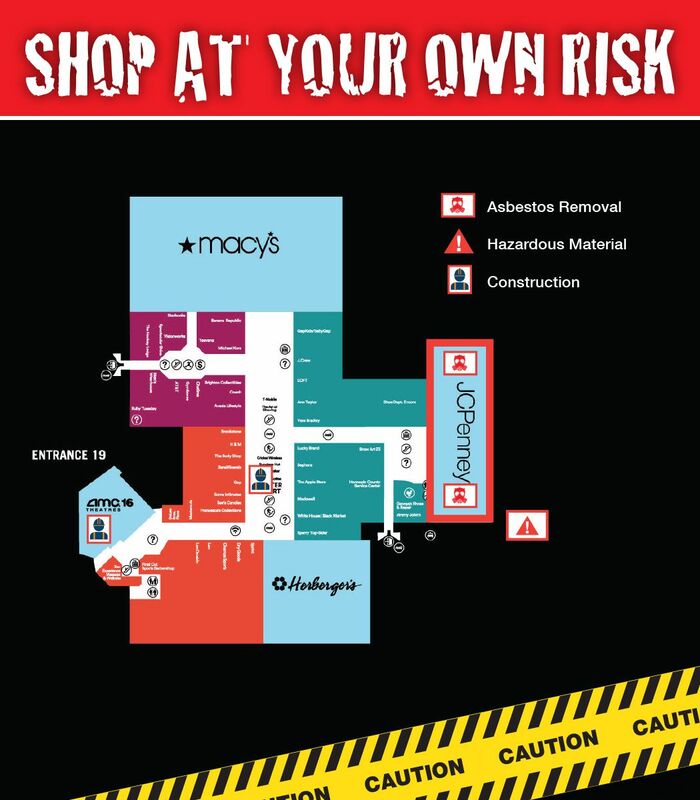 After a short press briefing featuring skilled construction workers wearing asbestos protection gear, the union will take its safety message directly to shoppers using flyers that feature maps of mall construction activity and direct shoppers to the Shop At Your Own Risk website and Facebook Page (see below). The union says says that they are particularly concerned by mall owner Simon Properties’ selection of an out-of-state contractor whose sister company has been cited for mishandling asbestos to remediate an old J.C.Penney location that will soon host the Twin Cities’ most luxurious Life Time Fitness branch. Workers employed by National Environmental Services Corporation, based in Bloomington, Indiana, are onsite under an asbestos removal permit that extends into the Christmas shopping season. The public information action planned for November 4 will feature laborers in asbestos removal equipment complete with protective suits and respirators. The campaign represents a revival of the unions’ “Shop at Your Own Risk” campaign, which was launched in 2014 when representatives uncovered a series of safety lapses during the renovation of Ridgedale Center in Minnetonka. What: Union members deliver safety message to shoppers and mall employees wearing full abatement suits and gas masks.